Erwin Libbrecht is one of the founders of the folk revival in Flanders and Heather Grabham was born in the cradle of the English folk. 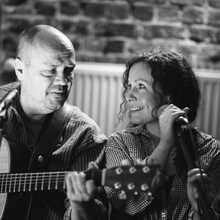 They have been combining their musical talents for about ten years and have played together or individually in renowned groups like Kadril, Faran Flad, The Dusty Millers, Jiggit and Tan Tethera. Listen to them while they are singing a few of their favourites from the English, Flemish and American tradition. With songs from amongst others Martin Carthy, June Tabor, Nathalie Merchant and Derroll Adams. This duo represents returning to a simpler sound and style. A glimpse in their living room, while they are playing music around the kitchen table. With banjo, guitar, whistles, harmonica and voices, naturally.